The graphic above is one of the findings of a major research study SACS undertook in partnership with the Scanlon Foundation, an NFP dedicated to advancement of the cause of inclusion. We measured a range of characteristics of a very large sample of people (just under two and a half thousand) including their “attitudes toward diversity”. 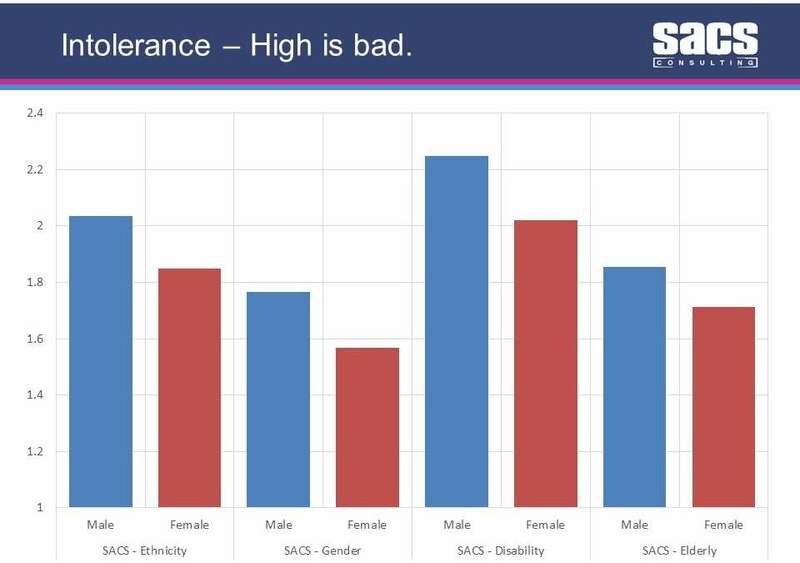 The SACS Attitudes Toward Diversity measure assesses how tolerant people are to different aspects of diversity – ethnicity, gender, ageing and disability. The measure has been cross validated against international assessments and has been used in a number of research settings. Hundreds of organisations also use it in recruitment to assess whether a prospective employee possesses intolerant attitudes to the ageing, people with disability, women or those from a different ethnic background (click here to find out more). When we measured this very large sample and compared men and women we discovered what many other research teams around the world found. Women are markedly more inclusive than men. The findings were similar across all types of inclusiveness. This is one more good reason to make sure that you have good gender balance in your leadership ranks. Diversity is good business and women are more naturally inclined to it. Are you too detail minded to be a CEO?